This is my blog recap for May, my fifth (or fourth? I started during the last days of January...) month of blogging here about illustration, freelancing, creativity and productivity. So how did May treat me? Let's compare to the previous month, get into the nitty-gritty details of my Etsy shop and income. Work on (client and personal) projects I enjoy and that reflect my art style. Expand my existing selection of stickers and art prints on Etsy. Create digital downloads for my Etsy - both to get around the long shipping duration from South Korea to pretty much everywhere and to have a bit of a passive income stream. Having fun! Mostly with blog posts that show my different interests, all illustrated. I'm aware that this won't all happen by tomorrow, or even in one year. But each step away from work-for-hire freelancing where I don't retain rights or don't like the style and theme, and each step towards more financial independence is a step in the right direction. First Month of Blogging! A fresh start. Four Months of Blogging and Four Lessons Learnt! My blogging recap for April wasn't the most optimistic of my blog reports. Everything seemed to be stagnating and I had quite the learning curve still ahead of me! ... the blog and income numbers are looking up! Well, look at that, I finally managed to get to 2k pageviews! Not only that, but there's a lot of new visitors and I'm generally happy with the upwards trend. With my traffic being balanced right now - I really like how the different channels are all well represented - I still wanted to show some details for my social media accounts below. I've been taking it slower on social media in May since I had a lot of commission work that took all my focus. But I hope to post (and grow) more in June! After the low in April (the short version of that: Family visit kept me from working more than the bare minimum of commissions and freelance jobs and threw my schedule on its head) May was a welcome change! I finally hit the 1k income goal with my illustration work! Yay!! Combined with my work-for-hire freelancing income, that actually would make for an acceptable monthly income to live on here in South Korea. So this definitely is a huge step in the right direction! BUT: I know that hitting this goal every single month consistently will be hard. Commissions are an irregular affair and monthly earnings as an illustrator can vary a lot. My Take-Away Lesson: Prices need to go up. My commission rates are very low if counted by hours of work, a decision that comes from me living in South Korea and being used to local pricing from my freelance jobs - but as a perfectionist and with a detail-rich art style, my commission pieces atm are underpriced. I can't work substantially more than I do right now (I'd have to quit my steadier freelance work completely for that, which scares me!) so I'll be adjusting my prices gradually during the summer. Still doing research on that! 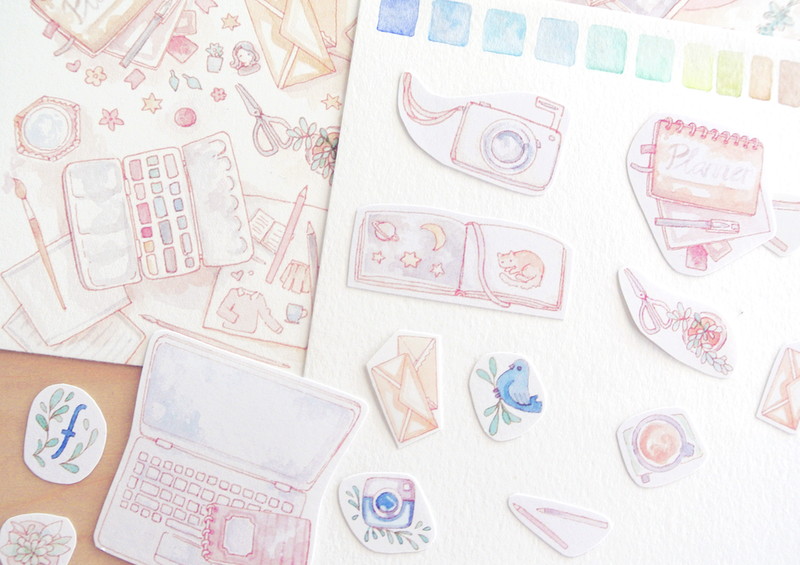 Etsy changed their seller's tools in May, and I'm still adjusting to the new statistics. Pageviews have been replaced with unique visitors for the long-term overviews, to I'll have to change things up in the future. But anyway, I made 64$ (after deductions/fees etc) this month. Still peanuts compared to what most Etsy sellers make - but more than half of my income was made from digital downloads (mostly my printable planner stickers)! Since I want to shift to mostly digital sales in the long run, that's encouraging. By sets, I mean printables with several pages or otherwise more elaborate. 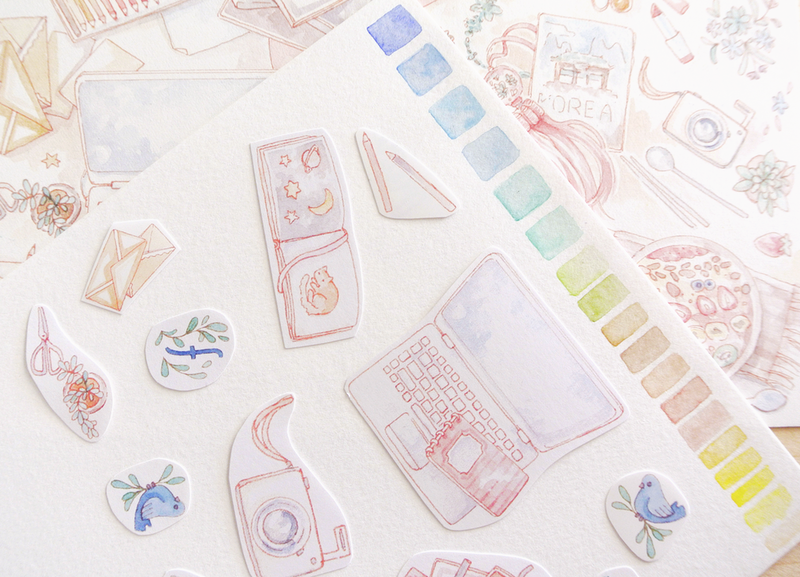 While small, single page printable sticker sheets are easier to make and fun little projects for when I have time off, they also do rack up listing and renewal fees on Etsy that are disproportionate to their revenue. Selling a printable file for 1.60$ gives me a 0.20 listing fee. Selling a printable file for 3.00$ gives me a 0.20 listing fee. Selling a printable file for 10$ gives me a 0.20 listing fee. But other than that, I'll continue on the same track and steadily add new digital listings while I let my physical ones run out. I'm at 37 digital listings right now, up 7 from April. I'm not big on actual blog income and affiliates, but I did have another drop into the bucket from both Amazon Associates and Society6, for a total of 4.20$. So proud. Yup. 68.20$ in Passive Income, 1080$ in Commission Income. Looking forward, here's what I hope to accomplish in June, on top of continuing my freelance work, adding in new commissions and working at the cafe (which is getting busier in summer!). Up the total of printable/digital products on Etsy to 50! 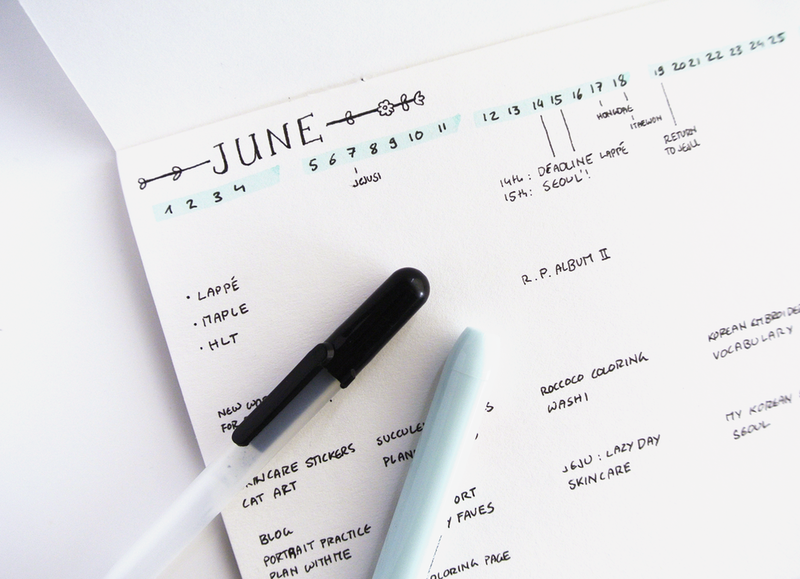 Here's my planning process and bullet journal setup to make sure that I hit those goals - plus how I plan on adding a bit of relaxation and self-care into my schedule for June! Wish me luck for the next couple of months - I'll be going on my first vacation longer than 3-4 days in August and really need to get a lot done before that. I hope you all have a good start into June and summer, too! Stay creative!